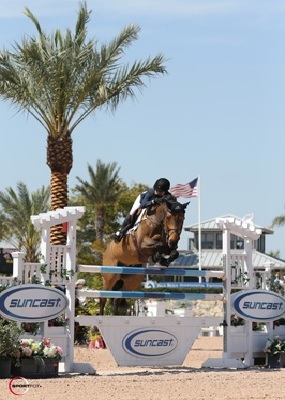 On Saturday afternoon, the $33,000 Suncast® 1.50m Championship Jumper Classic was held with a win for Jessica Springsteen (USA) and Stone Hill Farm’s Vindicat W. Forty entries showed in the class with 15 advancing to the jump-off and only three clear rounds over the short course. Springsteen and Vindicat W cleared the course in 44.33 seconds for the win. Richie Moloney (IRL) and Equinimity LLC’s Carrabis Z finished second in 44.86 seconds. 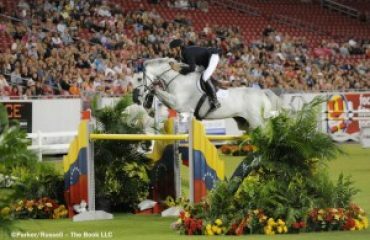 McLain Ward (USA) finished third with The Wannahave Group’s Wannahave with a clear round in 45.77 seconds. Ward was also fourth with the fastest round of the day but incurred four faults in 41.88 seconds aboard Grant Road Partners’ Super Trooper de Ness. Jessica Springsteen and Vindicat W. Photo © Sportfot. Springsteen and Vindicat W, an eleven-year-old KWPN gelding by Guidam x Libero H, also won the $82,000 Suncast® 1.50m Championship Jumper Classic during week nine of FTI WEF competition. Springsteen purchased the horse in August of last year just after the Olympic Games in London where he was the mount for Peter Charles in the British team’s gold medal win. The rider, who is currently in her junior year at Duke University in North Carolina, has traveled back and forth from school to compete this winter. She has been taking her time to build a good partnership with the talented gelding while showing as much as possible in between a busy schedule of classes. On Saturday, the duo proved that they were perfectly in sync with another exciting win. They went third in the jump-off and could not be beat after that. Springsteen also won the $15,000 RCG Farm SJHOF High Amateur-Owner Jumper Classic on Saturday with Stone Hill Farm’s Wish. With some of her top horses going so well throughout the FTI WEF circuit, she is looking forward to traveling to Europe for the summer to compete. 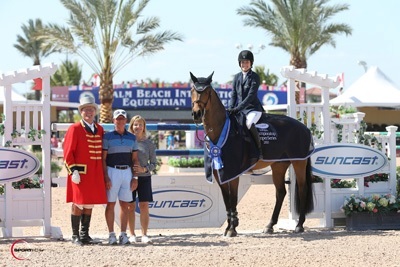 Jessica Springsteen and Vindicat W in their winning presentation with ringmaster Cliff Haines and Tom and Jeannie Tisbo of Suncast. Photo © Sportfot. 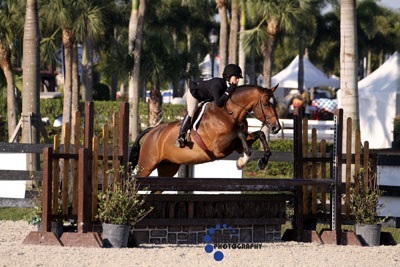 Molly Zisook rode her eight-year-old Westphalian mare C’est Si Bon to victory in the THIS National Children’s Medal 14 & Under class during week twelve of the FTI Consulting Winter Equestrian Festival. Zisook, of Lake Forest, IL, bested the class of twenty-nine entries after a first round score of 87 landed her in the top four called back to test. Second place went to Lucy Deslauriers, who finished with a score of 86 with Stonehenge Farms’ Al Pacino. Olivia Bruyn came in third with a score of 84 with Square One, owned by Beacon Hill Show Stables. The top four was rounded out by Emma Kurtz and Marigot Bay Farm’s Starts Go Blue. The pair scored an 83. Zisook has owned her mare, affectionately known as “Bon Bon,” since 2012 and has successfully shown her the final two weeks of the FTI WEF. Before Saturday’s victory, Zisook and Bon Bon placed second in the THIS National Children’s Medal 14 & Under class during week eleven. 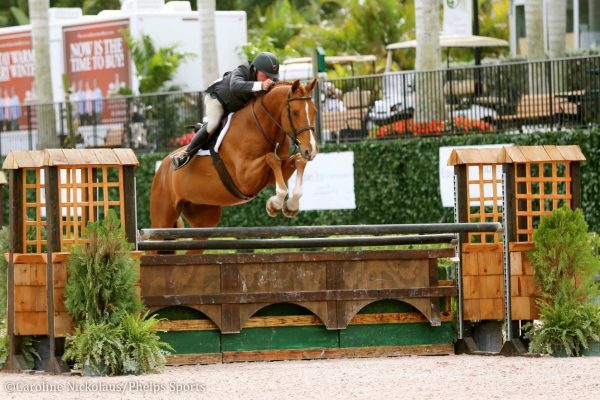 The pair has also shown in the Coldwell Banker’s Children’s 14 & Under Hunter division. Molly Zisook and C’est Si Bon. Zisook’s dedication to improving her mare’s rideability paid off this week with their blue ribbon finish. 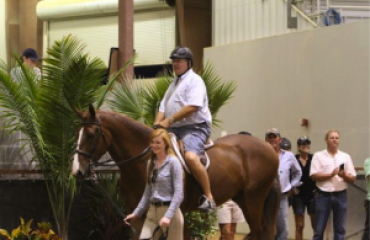 “We practice a lot of lengthening and shortening to help get her on the bit more. 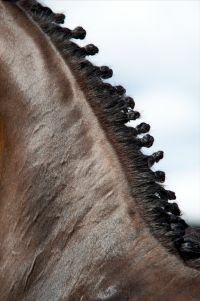 We also do a lot of trot jumps and practice the turns,” Zisook described. The pair was clearly well prepared as Zisook and Bon Bon had no issues with a course that overfaced several competitors. “I thought the course was straight-forward. Going into the test, I wanted to be able to do it efficiently and not get stuck anywhere,” Zisook commented. Zisook and Bon Bon will continue to show throughout the spring and summer, with their ultimate goal being to move up to Junior Hunter divisions. Trainer Jill Knowles is confident in Zisook’s progress over the past year and looks forward to coaching her as she moves up. 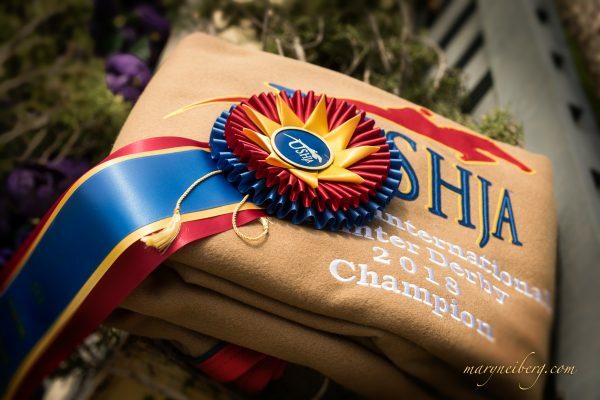 The first round of the $50,000 USHJA International Hunter Derby was held in the E.R. Mische Grand Hunter arena to wrap up hunter competition for the day on Saturday. 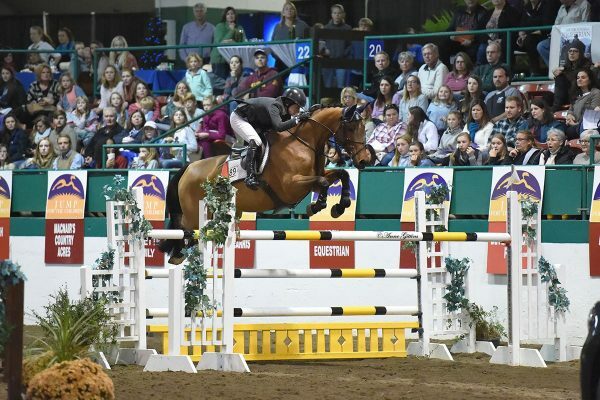 Fences for the class reached nearly four and a half feet tall for the high options, providing particularly exhilarating entertainment for the large crowd of hunter fans watching the class. 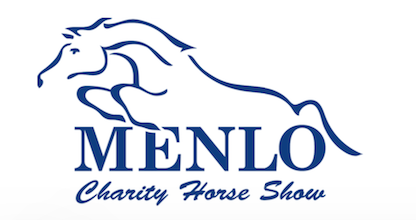 Brunello and Liza Boyd emerged victorious from the round of forty-one entries with a score of 188. Skyfall and Louise Serio were second with a combined score of 187. Taken and Kelley Farmer rounded out the top three with a score of 187, with the lower score from the tie-breaker judges’ panel. Week twelve of the FTI WEF, presented by title sponsor FTI Consulting, concludes Sunday with the Beval Palm Beach Adult Medal Final, hosted in the Rost Arena of the Palm Beach International Equestrian Center (PBIEC). 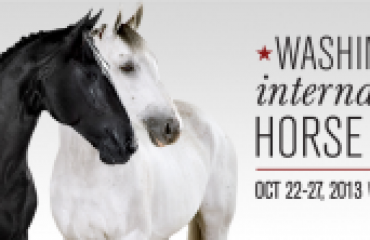 The $50,000 USHJA International Hunter Derby will also crown its winner Sunday afternoon at The Stadium at PBIEC. For full results, please visit www.showgroundslive.com. Photo Credit: Photos © Sportfot, An Official Photographer of the FTI Consulting Winter Equestrian Festival, us.sportfot.com, and Anne Gittins Photography, An Official Photographer of the FTI Consulting Winter Equestrian Festival, www.annegittins.com and Mancini Photos, www.manciniphotos.com. These photos may be used only in relation to this press release and must include photo credit. $200,000 Gene Mische American Invitational: Who Qualifies?